Catholics in the colonial town of Taxco in southern Mexico marked the start of the Holy Week by re-enacting the Passion of Christ. 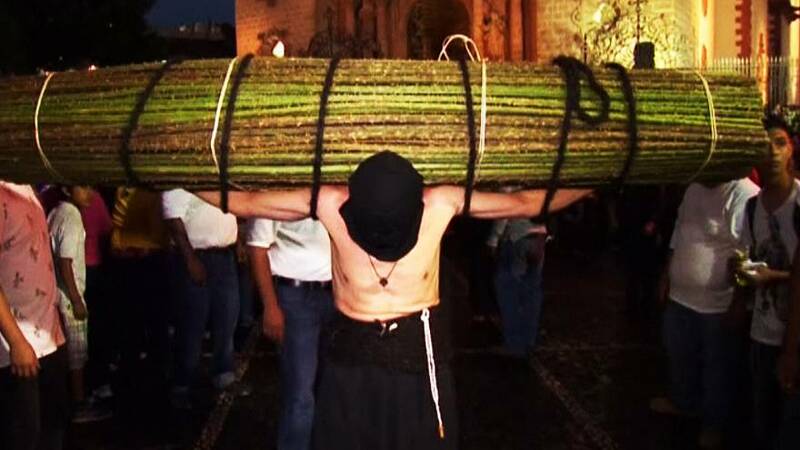 The “encruzados” (The Crucified) carried large bundles of thorny branches tied to their shoulders, while holding candles in each hand. They bore their heavy bundles, weighing between 30 to 50 kilogrammes (66-88 pounds), to emulate the suffering of Jesus Christ carrying the cross. The flagellants used a kind of whip made of a rope and nails called “disciplina” (discipline). Masked women, known as “encorvadas” (hunchbacked), walked barefooted through the cobblestone streets, dragging chains and carrying crosses. Thousands of tourists attend the elaborate Holy Week parades in Taxco, appreciating the traditional processions which date back to 1622.